I recently told you about Om as one of the most recognised spiritual symbols. So, this week, I decided to tell you more about mantras. What are mantras, and how can we use them for body positivity purposes? Mantras are spiritual messages that have been used for 3,000 years. They can be either words or whole sentences. The word mantra breaks down into two Sanskrit parts: man- meaning mind, and -tra meaning instrument, or tool. Mantras are therefore ‘instruments of the mind’, helpful to keep you focused, and to connect with your inner self. Saying or chanting a mantra with intention allows you to slow down, and to concentrate on the mantra’s message. This can be useful when doing yoga, meditating, or even in daily turmoil. The more we repeat the mantra, the more we come to believe it. 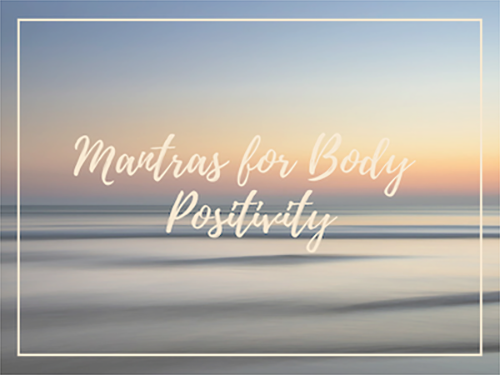 This can be very effective to build up body positivity, because mantras often promote self-acceptance and self-love – so here are four mantras that could benefit you in that perspective. Shanti meaning peace and Om conveying the image of infinite love, this mantra promotes the idea of peace and acceptance, which can be oriented towards your body. The Om is very widely used in yoga classes, because it is particularly helpful and efficient to help students removing any distracting thoughts they might have, and because it is a way to wish others divine peace. The term Shanti is also used as a synonym of Nirvana, which is the goal of any Buddhist practice. When doing yoga or meditating with this mantra as an intention, we aim at being in peace within ourselves. Alternatively, Shanti can be repeated three times, to represent peace in your body, your spirit and your mind. This mantra expresses the idea that you are a divine individual and, as such you should seek self-realisation. While Namo means to bow or to salute, Narayanaya has several possible interpretations. The most referred-to is Naara- translated by human, and -Anaya translated by direction or goal. The mantra therefore means that you should ‘bow towards the goal of a human’, which is like saying that you should respect and honour all human beings (including yourself) and their choices (including yours). By chanting this mantra, you allow yourself to achieve your goals. Once you are confidently in such a place, you can in turn also send positive vibes to all the people of the world, which is a virtuous circle. Yam is considered to be a cleansing mantra, because it focuses on one distinct chakra, the heart (Anahata). Chakras are specific points within our body that are responsible for an emotional experience. The sound yam (pronounced yum) has its own specific vibration that connects with the heart, so when you chant it, you actually vibrate with it – this is why this mantra is said to promote self-love as well as healing thoughts. Saying yam makes love, compassion and acceptance flow within yourself. These can be used to let yourself accept and love the body you have, because this is the only one you got, and it should be cherished. Remember that you can fully achieve yourself only if you unconditionally love yourself first. The Yam mantra is a powerful way to help you do so. This mantra is made of three words: baba, meaning beloved, nam, meaning name, and kevalam, meaning only. The literal translation is therefore ‘Only the name of the beloved’. The interpretation of this mantra is that we are constantly surrounded by love. It comes both from an external perspective (others around us) and an internal perspective (your own body and self, because your essence as a human is love). Chanting this mantra is a good reminder for us to acknowledge this. It allows you not to forget to take the part of love that you deserve too, which includes loving your body. The more you chant it, the more you will actually be convinced by it. You probably at least experienced a once-in-a-lifetime moment in which you were surrounded by love. Remind yourself of how good that felt. This is the exact same thing that you do when chanting Baba Nam Kevalam.